La question des modes d’organisation territoriale des sociétés humaines reste peu explorée pour le Néolithique dans le Centre-Ouest de la France. Répertoriés dès 1840, des monuments aussi imposants que ceux de Tusson ou Luxé (Charente) n’avaient fait l’objet d’aucun relevé topographique détaillé. Ils apparaissent aujourd’hui comme des buttes boisées dans un paysage ouvert, situation à peu près inverse de celle que l’on imagine pour ces périodes préhistoriques, au vu des rares données palynologiques disponibles. Les acquis de fouilles récentes comme celles de Péré à Prissé-la-Charrière (Deux-Sèvres) permettent désormais de proposer quelques modèles de restitution en élévation pour les monuments allongés ou circulaires. À travers l’intégration de modèles numériques (terrain et végétation) et de la discussion sur la restitution architecturale des monuments, ce travail tente de contribuer à une interprétation sur la façon de concevoir l’espace au Néolithique dans le cadre de la façade Atlantique de la France. Parmi les résultats obtenus, il faut souligner le rôle des grands tumulus allongés dans le paysage de la région, l’importance du concept de nécropole, ainsi que l’exclusion de l’ensemble de Chenon de la logique de visibilité propre aux ensembles de Tusson – Luxé – La Boixe. Research on the territorial organisation of West-Central France Neolithic societies remains underexploited. Inventoried from 1840, impressive monuments such as those in Tusson or Luxé (Charente region) had not even been the object of detailed topographic survey. They appear today as forested mounds in a largely open landscape; a likely opposite situation to what we might expect occurred in prehistoric times if we rely on the (scarce) available palynological data. Recent excavations like those from Péré in Prissé-la-Charrière (Deux-Sèvres) offer new data for the restitution of long and round monuments’ elevation. Through the integration of digital elevation models (topography and vegetation) and the discussion on architectural restitution of monuments this paper intends to contribute to the interpretation of Neolithic space in the French Atlantic façade. 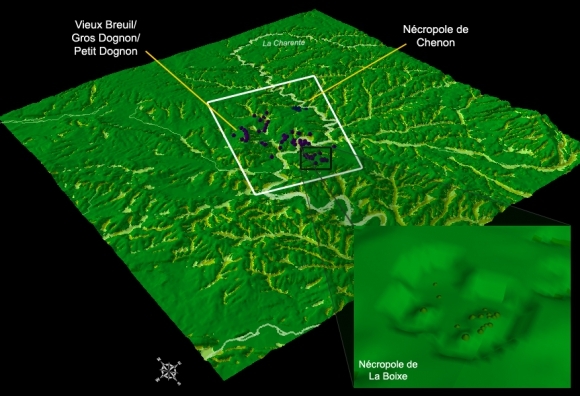 Among the results obtained it is worth to highlight the key role of the long tumulus in the regional landscape, the relevance of the necropolis ensembles, and the exclusion of the Chenon group of monuments from the visibility coherence of the Tusson – Luxé – La Boixe ensembles. West-Central France, Charente, Middle Neolithic, long mounds, necropolis, territorial analysis, Geographical Information Systems (GIS). Les auteurs voudraient remercier le Service Régional de l’Archéologie de Poitou-Charentes. In western France, the vast majority of the megalithic monuments whose construction is attributed to the fifth or first half of the 4th millennium BCE is mainly located on the Jurassic facies of the northern Aquitaine and western Paris basins, in the coastal plains in the Massif Armorican – passage graves –, and on the Cretacic terrains near the Loire – angevin dolmens – (Kerdivel 2009: 336). The department of Charente is one of the southernmost sectors of this vast geographical area, bounded on the north by the Seine estuary and on the south by that of Gironde. 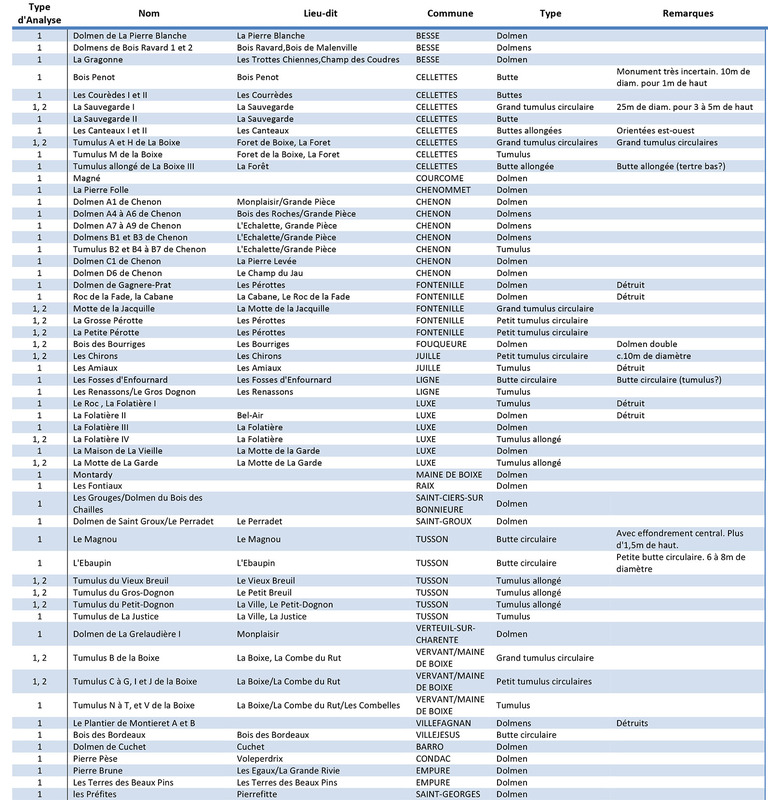 The inventory of the megalithic monuments of the department of Charente currently records 483 monuments (dolmens, tumuli, standing stones and burial cists). The inventory reveals a high concentration of megalithic monuments in the Ruffecois around Mansle. On both sides of two successive changes in the orientation of the Charente valley a number of necropolis – among which those of Chenon, La Boixe, Luxé and Tusson –, are located. Among the most famous monuments of these ensembles, the Gros Dognon long mound is 138 m long and 9.80 m high, 36.5 m wide on its shorter side and 51.3 m on its larger. The La Folatière long mound is 143 m long and certainly more than ten meters high. Together with monuments such as Newgrange in Ireland, Silbury Hill in England, or Antequera in southern Spain, this is some of the largest and most impressive Neolithic mounds in Western Europe. 2Through the integration of digital elevation models (DEM) and vegetation modelling, and taking into account the discussion on the restitution of architectural monuments, this work proposes an innovative approach for the study of the monuments in this region. Data from different sources (archaeological, palynological and geographical) were subjected to several scenarios (working hypothesis) to identify the criteria that guided the installation and development of human settlement during the Neolithic in the region. There is a debate regarding the extension and limits of visual human perception with respect to digital viewshed analysis. Some research on landscapes like that of Higuchi (Higuchi 1975) proposed a series of classification levels based on the perception visible to the observer depending on distance. In light of these studies and considering the objectives of our own analysis, we decided to adopt a 20 km radius distance for each site to calculate visibility. The nature of the sites considered (usually large monuments), on the one hand, and the need to understand the elements structuring the landscape (ridges, valleys, elevations ...), on the other, justifies this choice. The geographical analysis were carried out using ArcGIS software. Simple viewshed analysis and Cumulative Viewshed Analysis (Wheatley 1995) were performed. 3We decided to model a simplified forest screen from the DEM considering the (scarce) palynological data available and the different landforms of the regional landscape (for complex and permeable modelling of the vegetation see Llobera 2007). This option allowed us to test the validity of the monuments under very restrictive visibility conditions. Clearance areas around the monuments and monument elevation (architectural restitution) were also modelled. 4These analyses have allowed to explore, to compare and to objectify the behaviour of the sites studied. This has been done in relation both to their particular location (single-site perspective) and to their interconnection. In all the scenarios analyzed the long mounds appear as prominent elements in the regional landscape. The necropolises of circular monuments seem to be set apart when restrictive vegetation conditions are applied. Hierarchy of monuments by mass, size or topography seems to be limited in such cases much more to the necropolises themselves than to their position in the landscape. At the regional scale it is interesting to note the exclusion of the Chenon ensemble from the ‘visibility logic’ specific to Tusson - Luxé - La Boixe. It is located on the centre of a small depressed plateau overlooking the river. The necropolis remains hidden from the view to any observer located on high points in the landscape; it is precisely on those locations that most of the megalithic monuments are situated in the region. The relationship between the monuments and the Neolithic settlement areas in the study area remains unclear. However, considering currently available data, it seems likely that there is dissociation in the location of these areas and the monuments. 5Lastly, the landscape in the study area can be defined as an aggregative monumental landscape, built over the centuries. This aggregation can be tracked at three complementary levels: a regional level, with the establishment of the monuments in different areas of the regional geography; a local level, with the grouping of monuments within a necropolis; an intra-site level, with the life-history of every monument. Indeed, the megalithic monuments have lasting impact on the landscape. Their shape may have changed and the timing of their construction can be discussed. Particularly, long mounds are in western France always the result of a singular history; they cover funerary structures whose sepulchral architecture can be very diverse (cists, passage graves, etc.). The latest excavations at Prissé-la-Charrière (Deux-Sèvres) and in Le Souc'h (Plouhinec, Brittany) have shown that they often cover a large part of earlier necropolises in which each pre-existing monument had its own architectural history (Le Goffic 2006, Laporte et al. 2010). Classifying and dating these long mounds only from their external architectural form would be nonsense. Among the sepulchral areas that probably covers the great mound of Motte de la Garde (Luxé) there is certainly at least an angoumoisin dolmen. 6Throughout western France the way these large mounds are presented to us today is systematically representing the end of a cycle whose terms are specific to each place. It is still difficult to clarify whether this final phase epitomises a single mode, where all were built at about the same time. It is however certain that this mode does not take place until the very end of the 5th millennium BCE. 7Dans l’ouest de la France, on dépose désormais les morts sur le sol que foulent les vivants, au sein d’espaces sépulcraux construits en élévation. Ceux-ci s’inscrivent au sein de masses monumentales dont les volumes sont bien plus imposants que ceux nécessaires pour indiquer seulement la position du sépulcre, ou assurer l’équilibre de ses parois. R. Joussaume a souvent insisté sur le fait que ces monuments avaient été faits pour être vus (Joussaume 1985, 2003a). A. Testart les qualifie même d’ostentatoire, terme qui renvoie bien sûr à ceux de sa propre classification des sociétés (Testart 2005). Aujourd’hui, ils nous apparaissent sous des formes parfois très différentes, tels une butte dans un sous-bois ou quelques énormes pierres dressées au milieu des champs. N’oublions pas qu’il s’agit toujours de ruines et qu’un travail de restitution sera nécessaire. N’oublions pas non plus que chacun a sa propre histoire (Laporte 2010a), tout comme le paysage dont ils font partie (Chouquer 2008). 8On peut dès lors se demander dans quelle mesure chaque monument a été construit en ce lieu précisément pour pouvoir être vu, ou pas ; et d’où ? Dans le Centre-Ouest de la France, celle concernant la nécropole de Bougon fut parmi les premières à utiliser les moyens informatiques les plus actuels pour tenter de répondre à cette question (Roughley 2002). Elle met en oeuvre une méthodologie qui avait déjà été largement éprouvée ailleurs (p.e. Wheatley 1995). D’autres approches privilégient le point de vue offert à tout observateur au sol à partir de chacun de ces monuments (Criado Boado & Villoch Vásquez 2000, Cummings et al. 2002). 9L’étude de la nécropole de Champs-Châlon (Charente-Maritime) avait été l’occasion pour R. Joussaume d’insister sur tous ces monuments mégalithiques du Centre-Ouest de la France qui se trouvent alignés sur une crête (Joussaume et al. 1998). La nécropole de Tusson, sur laquelle nous reviendrons également, en est un très bel exemple. Faut-il pour autant confondre l’espace que l’on peut ainsi contrôler visuellement, avec le territoire de chacun des groupes humains qui viennent déposer quelques uns de leurs morts en ce lieu ? Les limites de l’espace perçu ne sont pas toujours exactement celles que l’on conçoit, de même qu’elles ne tiennent pas toujours compte des obstacles rencontrés quand on le parcoure. Sur ce point, une autre communication à ce colloque (Sevin-Allouet & Scarre, ibid) a notamment très bien résumé, en français, ce que Tilley avait écrit en anglais au début des années 1990 (Tilley 1994). 10Depuis le début même de la Préhistoire, les chercheurs ont abordé l’étude des territoires à partir de points de vue différents : référentiels anthropologiques, modes d’accès aux ressources alimentaires, gestion et répartition des matières premières, organisation spatiale des sites archéologiques... La définition même de territoire varie selon les disciplines, et est également liée à la discussion sur l’espace et le paysage. Les avancées actuelles en matière de Systèmes d’Information Géographique (SIG) ont introduit une nouvelle dimension à ce type d’approche. Cependant, il est essentiel de rappeler que l’analyse des territoires existait en Archéologie bel et bien avant le développement de cette phase, avec notamment l’adaptation des méthodes de la Géographie physique et de la Géographie de la population. 11Dans l’ouest de la France, la très grande majorité des monuments funéraires mégalithiques dont la construction est attribuée au Ve ou à la première moitié du IVe millénaire av. n.e. se répartissent préférentiellement sur les terrains jurassiques du nord du Bassin aquitain et de l’ouest du Bassin parisien, ou dans les plaines littorales du Massif armoricain, pour les dolmens à couloir, et sur les terrains du Crétacé, notamment près de la vallée de la Loire, pour les dolmens angevins (Kerdivel 2009: 336). L’ensemble constitue l’un des pôles majeurs du mégalithisme atlantique d’Europe occidental, sur une aire géographique au sein de laquelle on va retrouver nombre de points communs, ou d’évolutions parallèles, dans les architectures comme dans les pratiques funéraires (Laporte & Le Roux 2004). 12Le département de la Charente est l’un des plus méridionaux de ceux qui correspondent à cette vaste aire géographique, délimitée au nord par l’estuaire de la Seine et au sud par celle de la Gironde. Plus au sud encore, les terrains tertiaires du centre du Bassin aquitain verront éclore d’autres formes de mégalithisme, souvent (mais pas toujours) plus récentes. C’est également le cas pour les marges occidentales du Massif central (Joussaume et al. 2008). En Charente, il s’agit principalement de dolmens à couloir, parmi lesquels figurent ceux qui ont servi à la définition du type angoumoisin (Daniel 1950). Quelques dolmens du cognaçais s’en distinguent, qui ont un temps été rapprochés des dolmens angevins (Burnez 1976). L’allée couverte de Chenon, détruite en 1936, fait ici figure d’exception (Patte 1941). 13L’inventaire des monuments mégalithiques du département de la Charente compte à ce jour 483 monuments distincts. Celui proposé par C. Burnez fut longtemps le plus complet (Burnez 1976). Il fut actualisé à la demande du Service Régional de l’Archéologie, en 1993, par V. Lhomme puis, en 1994, par F. Bouin qui prit la peine de consulter à nouveau toute la bibliographie et qui effectua maintes vérifications sur le terrain. Ces deux documents sont restés inédits (Lhomme 1993, Bouin 1994). Ils nous serviront de base de travail. Depuis, quelques rapports de prospection ont encore étoffé un peu l’inventaire, notamment de part la découverte, dans les bois, de buttes anthropiques qui pourraient contenir une ou plusieurs chambres mégalithiques (Bernardin & Fabre 1995, 2000, Joy 1990, 1998, 2002). Ont été exclues, toutefois, quelques constructions en pierre sèche qui ressemblent un peu trop à des abris de charbonniers, notamment sur la commune de Cellettes. 14Cet inventaire fait apparaître une grande concentration de monuments mégalithiques dans le Ruffecois, autour de Mansle (fig. 1). Dès 1844, Michon signalait trois grandes buttes anthropiques alignées sur une crête, au sud du village de Tusson (Michon 1844) ; monuments que C. Burnez qualifia de tumulus géants. Jusqu’à ce jour aucun n’avait fait l’objet de relevés topographiques véritablement précis (Joussaume 1997). Ce fut la tâche à laquelle s’est attelé R. Bernard, démontrant ainsi que le Gros Dognon de Tusson et la Folatière à Luxé disposent de dimensions comparables à celles du tumulus Saint-Michel, à Carnac. Le Gros Dognon mesure 138 m de long et 9,80 m de haut, pour 36,5 m dans sa petite largeur et 51,3 m pour la plus grande. La Folatière, bien qu’entamé sur ses flancs par diverses carrières, mesure encore 143 m de long et assurément plus de dix mètres de haut. Les trois autres grands tumulus allongés de notre secteur d’étude sont parfois à peine plus modestes en taille : 91,8 m de long et 4,3 m de haut pour le Vieux Breuil, à Tusson ; 59 m de long et 4,3 m de haut pour la Motte de la Garde, à Luxé ; 57,4 m de long et 3,4 m de haut pour le Petit Dognon, à Tusson. 15Pour mieux définir notre zone d’étude, il nous a paru utile de commencer par caractériser les limites de cette concentration de monuments mégalithiques. Plusieurs méthodes ont été mises en œuvre à cet effet, parmi elles la densité des monuments mégalithiques dans le département de la Charente, la distance linéaire à partir de chaque site, et le temps de déplacement entre chaque site. Pour ce dernier le critère retenu est un temps de marche théorique (en terrain découvert) de moins d’une heure pour atteindre un autre monument mégalithique, dans le secteur qui contient notamment les nécropoles de Chenon, Tusson, Luxé et La Boixe. C’est aussi la seule partie du département de la Charente où la densité en monuments mégalithiques dépasse 0,05 sites par km² (densité entre 0,05 et 1,13 sites par km²). Un peu plus de 90 monuments mégalithiques ont ainsi été répertoriés dans un secteur d’une dizaine de kilomètres de rayon. 16Au sein de cette zone, une trentaine de monuments mégalithiques, soit un tiers des monuments répertoriés, ont été détruits entre le milieu du XIXe et la fin du XXe siècle. Un tel chiffre est probablement très largement sous estimé. 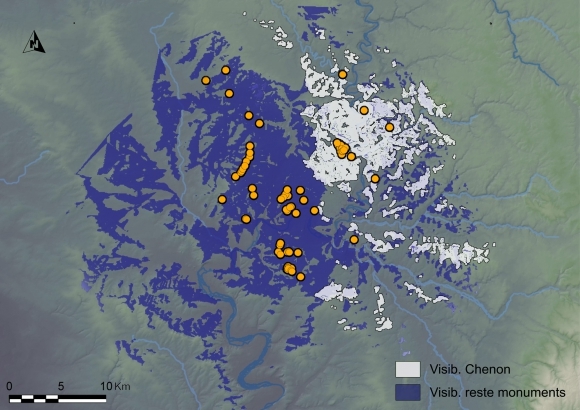 La moitié de ces destructions concerne la seule nécropole de Chenon où une quinzaine de monuments ont disparus, notamment à l’occasion de remembrements effectués au cours des années 1960 et 1970. Il ne reste pratiquement plus rien non plus de la nécropole mégalithique – composée d’au moins trois autres monuments – qui s’étendait au pied du grand tumulus de La Folatière, à Luxé. Seuls des témoignages oraux signalent encore l’existence, dans un passé assez proche, de petits monuments circulaires aux abords immédiats des grands tumulus de Tusson, pour ne prendre que ces quelques exemples. Pour autant, l’ampleur de ces destructions ne semble pas atteindre celles mentionnées pour certaines régions comme le nord de l’Allemagne, où elles concernent parfois jusqu’à plus de 80% du corpus. Le maintient d’importants couverts boisés, a été ici un facteur de préservation. 17S’attacher à étudier les relations de visibilité entre tous ces monuments demande également tenir compte de l’ensemble des masses tumulaires qui les englobaient initialement. Malheureusement, nous ne possédons aucune information à ce sujet pour une quinzaine des dolmens aujourd’hui visibles, et strictement aucune non plus pour presque tous ceux qui furent détruits anciennement. C’est presque la moitié du corpus qui échappe à l’analyse sur ce point. Un autre quart correspond à des buttes anthropiques qui n’ont jamais été véritablement explorées. La morphologie de ces anomalies topographiques, comme les matériaux de construction, leur orientation ou parfois la présence de carrières latérales permettent toutefois de les comparer à celles qui ont déjà été fouillées, et d’exclure leur attribution à d’autres périodes (mottes castrales, tombelles de l’âge du Fer, etc.). Des modèles prédictifs ont été appliqués en ce même sens pour classer les monuments détruits ou inexplorées dans d’autres régions européennes (López-Romero 2008a, Löwenborg 2009). 18Nous ne sommes ne serait-ce qu’un peu renseigné, à la fois sur l’architecture de l’espace sépulcral et au moins sur la forme de la butte dans lequel il s’inscrit, que pour un peu plus d’une vingtaine de monuments. Les fouilles anciennes ou modernes n’ont guère concerné que l’espace sépulcral, et parfois son couloir d’accès. G. Chauvet et A. Lièvre sont certainement ici ceux qui en ont fait explorer le plus grand nombre à la fin du XIXe siècle. Outre la fouille d’une dizaine de chambres dans la nécropole de La Boixe (Chauvet & Lièvre 1877) on leur doit également la découverte d’un dolmen angoumoisin à l’extrémité orientale du tumulus allongé de la Motte de la Garde. C’est en fait le seul espace sépulcral aujourd’hui connu pour l’ensemble des cinq tumulus géants implantés sur les communes de Luxé et de Tusson. Il a notamment livré une coupe à socle du Néolithique moyen, et un peu de mobilier artenacien, du Néolithique final (López-Romero et al. 2010). 19Plus près de nous, le Dr Gauron s’est surtout intéressé à la nécropole de Chenon (Gaurond & Massaud 1983), mais on lui doit aussi les fouilles effectuées sur le Gros Dognon de Ligné ou sur La Motte de la Jacquille, pour la commune de Fontenille (Gaurond & Massaud 1987). Les travaux de terrain effectués précédemment par le doyen Patte, notamment à la Folatière, furent sans doute un peu plus méticuleux (Patte 1966). Mais ils ne concernaient que des monuments déjà très ruinés. Au final seuls deux monuments sont susceptibles de fournir des informations qui soient en accord avec les critères les plus actuels de la recherche dans le domaine du mégalithisme (Laporte et al. 2011). Il s’agit du monument B de la nécropole de la Boixe et du monument C de cette même nécropole, tous deux étudiés sous la direction de J. Gomez de Soto (Joussaume 1990, Gomez de Soto 1997). 20Pas plus que les grosses pierres assemblées du dolmen, les buttes qui les recouvrent encore parfois, ou dont les vestiges s’étendent à leur pied, ne constituaient le spectacle offert à la vue de tous, une fois le chantier de construction terminé, au cours du Néolithique moyen. Les éléments disponibles pour tenter de restituer toute l’élévation de ces masses monumentales sont toutefois extrêmement rares. C’est donc plutôt une chance, après vingt ou trente ans d’efforts collectifs, que de pouvoir disposer, dans les départements limitrophes de la Charente-Maritime ou des Deux-Sèvres, de quelques exemples étudiés de façon approfondis, comme à Champ-Châlon et à Prissé-la-Charrière. L’histoire architecturale du monument B de la nécropole de Champ-Châlon à Courçon (Joussaume et al. 2006), nous permet ainsi de mieux comprendre la présence de deux dolmens à couloirs, juxtaposés au sein d’une butte de forme ovale et trapue, comme à Fouqueure ou pour le monument B1 de la nécropole de Chenon (Joussaume 2003b). On leur associera, au sein de notre inventaire, quatre buttes allongées de quinze à vingt mètre de long, découvertes sur la commune de Cellettes, bien distinctes des tombelles de l'âge du fer qui existent également à Chenon. De la même façon, on associera 6 petites buttes circulaires, d’une dizaine de mètres de diamètre (cf. tableau1), aux seize autres qui contiennent assurément un dolmen à couloir dont les parois sont alors souvent en pierres sèches. Tabl. 1. 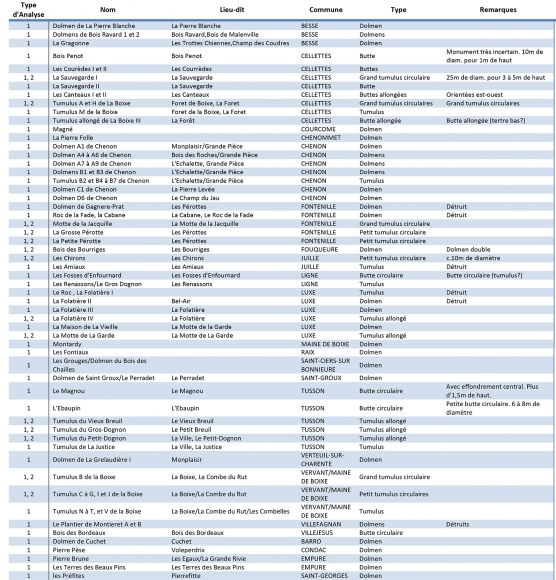 Liste des monuments pris en compte pour l’analyse. Type d’analyse : (1) Visibilité potentielle individuelle et visibilité potentielle cumulée (MNT) ; (2) Visibilité potentielle avec modèle de végétation (MNT+Veg). 21Ces petits monuments constituent la majorité de ceux pour lesquels nous sommes quelque peu renseignés quant à la forme du tumulus correspondant. À Prissé-la-Charrière, dans les Deux-Sèvres, Le cairn III, dégagé sous la masse d’un tumulus allongé de cent mètres de long, aurait pu en faire partie. Il mesure huit mètres de diamètre externe. Conservé sur plus de deux mètres de haut, il contient un dolmen à couloir (Laporte et al. 2002). L’étude du profil de ses parois externes permet de proposer une restitution en dôme de son élévation complète, pour une hauteur totale de l’ordre de quatre à six mètres (Laporte 2010a). À la suite des fouilles effectuées par Galles et Mauricet, à la fin du XIXe siècle, une telle élévation en dôme est également celle figurée sur une coupe transversale du tumulus du Moustoir, à Carnac, pour un autre petit monument circulaire. À titre d’hypothèse, nous étendrons cette proposition à l’ensemble des petits monuments circulaires dans le corpus ici pris en compte. 22La question est plus délicate pour les cinq monuments circulaires de notre corpus dont le diamètre atteint au moins 20 à 25 mètres (La Sauvegarde I, La Motte de la Jacquille, les tumulus A, B et H de La Boixe ; cf. tableau1). Disposant d’un très long couloir, peut-être construit en plusieurs parties, la Motte de la Jacquille fait partie de cette dernière catégorie. Le monument B de la Boixe également. Ici du moins, nous savons qu’il est ceinturé par deux parements concentriques qui correspondent à une rupture dans la construction du couloir et même à l’ajout d’une autre chambre funéraire. Le tumulus de Dissignac, à Pornic en Loire-atlantique, présente lui aussi deux parements concentriques qui furent restitués en élévation, par J. L’Helgouach, comme autant de gradins successifs (Giot et al. 1998). Les fouilles du Petit-Mont, à Arzon dans le Morbihan, ont toutefois montré que de tels parements présentent souvent un fruit croissant en élévation et qu’il tendent à se rejoindre vers le sommet (Lecornec 1994). Au sein de notre corpus, nous étendrons alors la restitution en dôme des élévations, proposée pour les petits monuments circulaires, à ceux de plus grande taille ; si ce n’est que dans ce cas leur volume est plus important. De tels monuments se voient sans doute de très loin, mais il paraîtrait très inconfortable de siéger en leur sommet. 23À Prissé-la-Charrière, la restitution en élévation qui découle d’une étude minutieuse de l’architecture du monument trapézoïdal de cent mètres de long est toute différente. Dans ce cas, les fouilles ont permis de dégager les vestiges d’une étroite plate-forme qui courre tout le long de son sommet, jusqu’à son extrémité la plus large qui est aussi la plus haute (Scarre et al. 2003). Un tel replat est également perceptible lorsque l’on parcourt le sommet des cinq grands tumulus trapézoïdaux allongés du Ruffécois, comme d’ailleurs pour ceux du Moustoir ou de Crucuny, dans le Morbihan. On ignore, en revanche, quel put être l’impact des travaux liés à la construction de la chapelle dans un éventuel élargissement de la très large plate-forme qui, de nos jours, accueille le visiteur au sommet du tumulus Saint-Michel. Des aménagements similaires pourraient être présents dans d’autres types de monuments. À Guidel (Morbihan) une plateforme de 6 m de largeur a été signalée au sommet du tumulus circulaire de Kerméné (Giot 1959) ; à ce fait s’ajoute le rôle particulier que ce monument semble avoir eu dans la structuration du paysage régional (López-Romero 2008b: 234-235). 24Une étude de la visibilité entre des monuments, ou à partir de chacun d’entre eux, repose d’abord sur la confrontation de deux facteurs que sont : la position géographique de chaque site et la morphologie du terrain. Celle-ci peut être caractérisée de façon qualitative (positionnement par rapport aux cours d’eau ou vallons, aux montagnes et collines, aux affleurements rocheux, etc.) ou quantitative (p.e. Modèles Numériques de Terrain, MNT). Suivant une méthodologie mise au point préalablement en Bretagne (López-Romero 2008c) ce travail part d’un modèle numérique de terrain obtenu par triangulation des courbes de niveau topographiques de 5 m. La résolution spatiale du MNT a été fixée à 50 m par pixel, ce qui s’accorde bien avec une étude de type micro-régionale comme la notre ainsi qu’avec l’échelle des données cartographiques d’origine. Toutes les analyses ont été effectuées sous ArcGIS. 25Il existe tout un débat en ce qui concerne l’extension visuelle et les limites de perception humaine par rapport aux analyses numériques de visibilité potentielle. Certains travaux sur le paysage comme ceux d’Higuchi (Higuchi 1975) proposent des niveaux de classification en fonction de la perception visible par l’observateur selon la distance. En tenant compte de ces études et des objectifs de notre propre analyse, nous avons décidé d’adopter une limite longue (rayon de 20 km de distance pour chaque site) pour le calcul de la visibilité. La nature des sites pris en compte (monuments parfois de grande taille), d’un côté, et le besoin de comprendre également les éléments naturels structurant le paysage (crêtes, vallons, élévations...), de l’autre, justifient ce choix. 26Pour mieux comprendre la façon dans laquelle les conditions naturelles de la topographie participent aux rapports de visibilité dans la région nous sommes partis d’une simplification du concept de total viewshed (Llobera 2003). Cette approche part du concept de visibilité cumulée (Cumulative Viewshed Analysis ; Wheatley 1995) et donne comme résultat la superficie globale visible depuis plusieurs points d’observation. Malgré le caractère relativement peu proéminent à l’échelle régionale de la zone de concentration des sites, le secteur central autour des méandres de la Charente présente des zones très favorables pour être vues depuis plusieurs points d’observation. 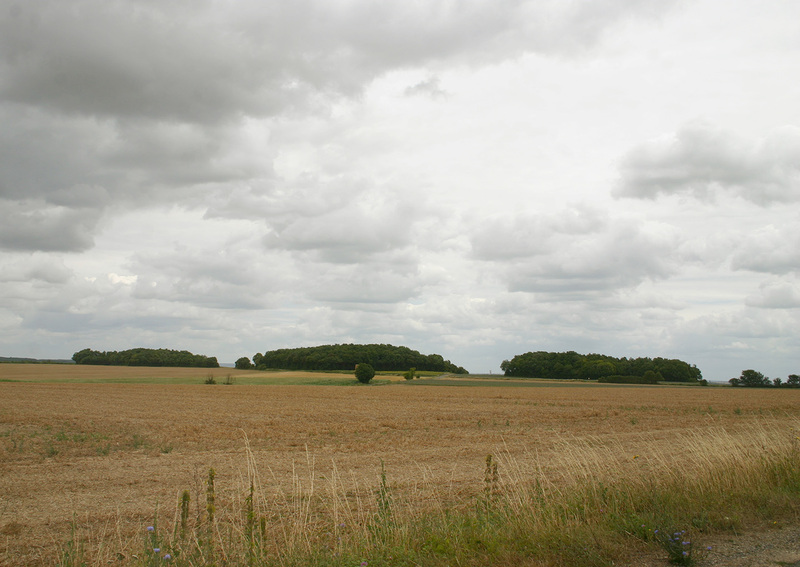 Remarquablement, c’est sur ces zones que se localisent nombre des monuments Ce constat fut également le point de départ d’un article précédent concernant les tumulus allongés du Centre-Ouest de la France (Joussaume et al. 1998). 27Une première analyse avec les monuments a consisté à calculer les zones de la visibilité potentielle induite par la position géographique de chaque site confrontée au modèle numérique de terrain. Les monuments situés sur une même crête qui traverse les communes de Tusson et de Bessé sont ceux d’où l’on aperçoit selon le modèle le plus grand nombre de monuments mégalithiques : 38 pour le Gros Dognon de Tusson, soit pas loin de la moitié du corpus. Viennent ensuite les nombreux monuments qui s’étendent du plateau de La Boixe jusque sur la commune de Cellettes, ou ceux qui leur font face, sur l’autre rive de la Charente, à Luxé ou à Fontenille : pour beaucoup, un observateur situé à leur emplacement géographique serait censé apercevoir entre dix et vingt autres monuments mégalithiques. Les monuments de la nécropole de Chenon sont un peu plus isolés dans la mesure où ils ne seraient guère visibles qu’entre eux. Ceux de Magné à Courcôme, de Fouqueure, des Fontiaux à Raix, ou des Grouges à Saint-Ciers-sur-Bonnieure, par exemple, le sont plus encore du moins en l’état actuel des données disponibles. 28Nous avons également entrepris une approche de visibilité cumulée pour tous les monuments mégalithiques répertoriés. Il en ressort que la visibilité directe des zones basses, en particulier de cours d’eau comme l’Aume et la Charente, est très réduite à partir des monuments mégalithiques. Or, ce sont dans ces zones basses que semblent se situer les très rares vestiges d’habitat susceptibles d’être attribués à la période du Néolithique moyen. L’exclusion visuelle entre sites d’habitat et monuments mégalithiques globalement contemporains est un fait qui a été constaté au sein de l’enclave calcaire de Falbigden, en Suède (Person & Sjjögren, 2001). Mais, pour ce qui nous concerne, il faut dire que les sites d’habitat sont extrêmement mal connus, ici comme dans tout le Centre-Ouest de la France. Peut-être étaient ils implantés préférentiellement au bord du fleuve et de ses affluents, si bien qu’ils seraient aujourd’hui recouverts par d’épaisses couches de colluvions, ou d’alluvions. C’est du moins ce que suggèrent les résultats de quelques prospections subaquatiques dans le lit de la Charente (Billaud et al. 2001). Cette hypothèse est donc à prendre avec précautions. D’autres découvertes sont encore possibles : un unique fossé d’enceinte fréquemment interrompue, qui reste à dater, barre l’éperon qui se prolonge par un plateau où se tient la nécropole de Chenon (Inf. V. Ard). 29Une autre analyse de visibilité cumulée a concerné la seule nécropole de Tusson. Elle semble dominer un petit cirque topographique situé à ses pieds, vers l’ouest. Cette forme du paysage a servi de base à la définition des limites des communes de Bessé, Ebréon, Souvigné et Tusson. À partir de la dizaine de monuments qui composent cette nécropole, partent autant de lignes de visibilité qui convergent vers le centre de la dépression. Le résultat des visibilités cumulées à partir des monuments de la nécropole de Chenon n’est pas si différente sur ce point, si ce n’est que la nécropole est placée cette fois-ci près du centre de la cuvette, au bord de la vallée de la Charente. On peut aussi calculer le taux de recouvrement de deux aires de visibilité cumulées, calculées à partir de deux nécropoles mégalithiques distinctes comme celles de Chenon et de Tusson par exemple. Dans ce cas, les aires de recouvrement sont pratiquement inexistantes (fig. 2), signant une différence majeure de comportement visuel pour ces deux ensembles. Il est alors intéressant de remarquer que l’aire de visibilité cumulée pour la seule nécropole de Chenon, exclue pratiquement tous les autres monuments mégalithiques du secteur. 30Parmi les critiques qui ont été adressées à ce type de démarche, figure l’absence de prise en compte du couvert végétal. Dans une analyse similaire pour la nécropole de Bougon, J.-Y. Rossignol faisait remarquer que la présence de boisements en dix endroits critiques suffisait à diminuer de moitié le nombre de relations visuelles entre les sites mégalithiques de ce secteur (Rossignol 2002, fig. 299). Or, l’étude palynologique des quelques carottages disponibles, effectués un peu en aval dans la vallée de la Charente (Marambat 1992) ou dans celle de l’un de ses affluents, la Boëme (Diot et al. 1986), suggère la présence d’un couvert boisé très largement étendu, au cours de l’Atlantique et du SubBoréal. Nous en avons retenu le principe, à défaut de disposer des données nécessaires pour élaborer un modèle de reconstitution paléo environnemental plus précis sur notre zone d’étude. Au lieu de prendre en considération des algorithmes complexes et des procédures avancées de modélisation de la végétation (Llobera 2007) nous avons décidé de modéliser un couvert végétal simplifié (opaque). Cette option nous permettait d’ailleurs de tester la validité de la visibilité des sites sous des critères certainement très exigeants. 31À partir du MNT initial, une première phase de modélisation a consistée à identifier les formes topographiques du paysage. Cette identification a été possible grâce à l’outil ‘Topographic Position Index’ (Jenness 2006) qui utilise une classification à 10 niveaux. En tenant compte des caractéristiques des différentes classes, ainsi que d’une observation détaillée de la topographie et de l’hydrographie de la région, nous avons attribué une série de valeurs de hauteur potentielle de la végétation: +0 m de hauteur pour les cours d’eau et les très fortes pentes, +2 m de hauteur pour la végétation au bord de l’eau, +4 m de hauteur sur les pentes fortes, +6 m de hauteur sur les pentes moyennes et légères, +10 m de hauteur dans les autres secteurs. À titre d’hypothèse nous nous sommes donc placés dans un cas un peu extrême où la presque totalité du territoire étudié serait couvert de bois dont les frondaisons, suivant les espèces, culmineraient autour d’une dizaine de mètre. Les valeurs du modèle de végétation sont ensuite ajoutées à celles du Modèle Numérique de Terrain. Il est intéressant de signaler que la plupart des monuments mégalithiques, à cause de leur situation, sont entourés d’après ce modèle par des hauteurs de végétation de six à dix mètres. 32Aujourd’hui la plupart des monuments mégalithiques du Ruffécois, lorsqu’ils ne sont pas recouverts par des vastes forêts, apparaissent comme des buttes boisées au milieu d’un espace ouvert pour les besoins d’une agriculture extensive (fig. 3). C'est-à-dire à peu près l’inverse de ce que l’on peut imaginer pour le Néolithique moyen. À Prissé la-Charrière, outre l’emprise des monuments eux-mêmes, la morphologie du paysage aurait été transformée sur près de deux hectares par le creusement de carrières successives et de marches aménagées à leurs abords, si l’on extrapole les observations effectuées autour du tumulus C à l’ensemble de la Nécropole (Laporte et al. 2001). 33Une deuxième phase de la modélisation a donc consisté à créer une clairière à l’emplacement de tous les monuments pris en compte. Deux hypothèses ont été formulées quant à l’extension de cette clairière, mesurant cent ou deux cent mètres de dégagement autour de chacun d’entre eux. Chaque fois que c’était possible – troisième phase de la modélisation –, il nous a paru important de replacer au centre de la clairière une restitution des masses monumentales correspondantes. Pour ce faire on a retenu la forme et la taille des monuments, soit dix mètres de diamètre et quatre mètres de haut pour les petits monuments circulaires, vingt cinq mètres de diamètre et six mètres de haut pour les grands monuments circulaires, et cent mètres de long, vingt cinq mètre dans sa plus grande largeur et dix mètres de haut pour les grands tumulus allongés. Nous avons déjà fait remarquer que de telles restitutions n’étaient possibles que pour un peu plus d’une vingtaine de monuments seulement. Le modèle numérique de terrain a été modifié en conséquence. Le résultat est donc un MNT qui intègre le volume des monuments et la végétation potentielle (fig. 4). 34La visibilité calculée disponible à partir de ces vingt un monuments a été testée pour chacun de ces trois modèles, correspondant à des clairières plus ou moins étendues et à des moments distincts dans l’histoire des lieux, avant ou après la construction des masses monumentales. La superficie qui peut-être appréhendée par un observateur situé au niveau du sol se limite généralement à l’étendue de la clairière pour tous les petits monuments circulaires et la majorité des grands monuments circulaires. La possibilité d’apercevoir au loin les monuments d’une autre nécropole est pratiquement nulle avec l’hypothèse d’une clairière de 100 mètres1. La superficie visible s’accroît toutefois considérablement avec des clairières de 200 mètres, en particulier pour les monuments situés sur une crête. Pour autant, le massif forestier formerait écran pour un observateur situé au pied du tumulus de la Motte de la Garde et qui dirigerait son regard de l’autre coté de la vallée, au sud vers la Folatière et au nord vers Tusson. 35En revanche, si l’on tient compte de la possibilité pour un observateur de se placer sur la plate-forme qui courre au sommet de longs tumulus dont la hauteur croît sur leur longueur, la situation change radicalement. Avec des clairières de 200 mètres, les superficies qui s’offrent alors au regard sont du même ordre que celles calculées sur terrain découvert. 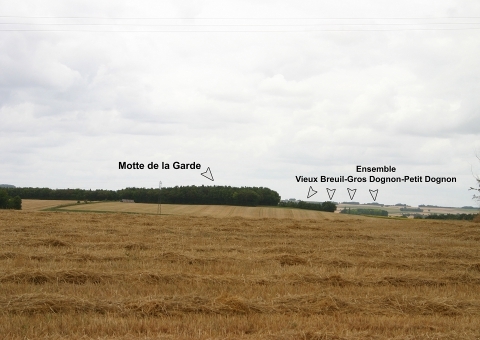 Dans cette configuration, les tumulus de Tusson ou de la Folatière, mais aussi bien d’autres monuments mégalithiques, émergent des frondaisons pour un observateur situé au sommet de la Motte de la Garde, par exemple. Cette superficie dépasse celle accessible à tout observateur situé au niveau du sol, si ce n’est peut-être depuis le sommet de la colline aujourd’hui couverte par le bois de Montbourg à Luxé. Parmi les monuments circulaires, seul la Motte de la Jacquille est placée sur un point particulier du relief qui, dans ces conditions, pourrait permettre à un observateur situé au niveau du sol d’apercevoir les monuments d’une autre nécropole mégalithique. En permettant de tester plusieurs hypothèses sur les différentes conditions des réalités physiques auxquelles ont été confrontées les populations du Néolithique, le recours à la modélisation numérique prend ici tout son sens. 36Une autre des critiques adressées à ce type de démarche met en exergue la dynamique des installations humaines, comme celle du paysage, que l’on aurait tendance à figer en quelques instantanés, au risque d’y agglomérer les vestiges d’installations qui n’ont jamais été strictement contemporaines. Contrairement à un village qui peut disparaître pour être reconstruit ailleurs, les monuments mégalithiques ont durablement marqué le paysage. Leur forme a pu évoluer toutefois, et l’ordre de leur construction peut être discuté. Les grands tumulus allongés de l’ouest de la France, en particulier, résultent toujours d’une histoire singulière, propre au lieu où ils ont été construits. De ce fait, ils recouvrent des espaces sépulcraux dont l’architecture peut être très diversifiée (coffres, caveaux, dolmens à couloir, etc.). Les fouilles les plus récentes, à Prissé-la-Charrière dans les Deux Sèvres comme au Souc’h, à Plouhinec dans le Finistère, ont montrées qu’ils recouvrent souvent toute une partie d’une nécropole préexistante dont chaque monument antérieur a un temps disposé de sa propre histoire architecturale (Le Goffic 2006, Laporte et al. 2010). 37Ces grands tumulus allongés représentent systématiquement la fin d’un cycle dont les modalités sont donc propres à chaque lieu différemment. Il est encore bien difficile de préciser si cette phase finale correspond à une seule mode, où tous auraient été construits à peu près en même temps. Cependant, il est certain que cette mode n’intervient pas avant l’extrême fin du Ve millénaire av. n.e., à Prissé-la-Charrière comme au Souc’h et probablement aussi à Barnenez, ou même pour le tumulus Saint-Michel (Joussaume & Laporte 2006, Laporte 2010b). En revanche, les datations effectuées sur quelques ossements provenant d’un petit monument à chambre circulaire en pierre sèche desservie par un couloir d’accès, le tumulus C de La Boixe, attestent que les personnes correspondantes sont décédées bien avant, soit au cours du troisième quart du Ve millénaire (Gomez de Soto 1997). La construction de l’un des monuments de la nécropole de Condé-sur-Iff en Normandie, similaire par son architecture, a pu être datée plus précisément. Il recouvre un foyer dont les charbons de bois ont été brulés un peu avant 4450 av. n.e. (cf. Dron 2010) Parmi les personnes dont le corps a été déposé dans la chambre, l’une d’entre elles est décédée un peu après cette même date de 4450. Tous les autres défunts de cette même chambre sont morts dans le millénaire qui a suivi (Dron op. cit.). Ces éléments de chronologie vont nous être utiles pour tenter de replacer les résultats des analyses précédentes dans le cadre d’une approche dynamique du territoire. 38La question de l’antériorité de tertres bas comme ceux du Morbihan littoral par rapport aux dolmens à couloir (Boujot & Cassen 1992) n’est pas ici directement d’actualité, dans la mesure où aucun des premiers n’a été formellement identifié dans notre secteur d’étude. Rappelons toutefois que nous soutenons qu’ils ont pu être édifiés de façon contemporaine, à l’échelle de l’ouest de la France du moins (Laporte et al. 2002). La question de l’association entre ces tertres bas et l’édification de longues files de menhirs, comprenant dans le Morbihan quelques très grandes stèles en orthogneiss, n’est pas d’actualité non plus car il n’est pas plus de menhir dans ce secteur du Ruffécois. Rappelons pourtant que nous soutenons tout aussi fermement que le fait de retrouver les fragments de certaines de ces grandes stèles en remploi n’est pas plus un gage qu’elles furent toutes édifiées en même temps, que cela ne l’est pour le remploi de nombreuses meules et polissoirs dans les monuments mégalithiques de la vallée de la Loire, par exemple (Laporte 2010b). Ces discussions ont tout de même leur importance car, par la même occasion, tertres bas et alignements de pierres dressées ont été chronologiquement associés aux grands tumulus carnacéens, alors considérés comme strictement antérieurs à tout ce qui contient un dolmen à couloir. 39Nous commencerons donc l’histoire de ce paysage mégalithique par la construction de quelques petits monuments circulaires à chambre circulaire en pierres sèches et couloir d’accès, quelques par autour du milieu du Ve millénaire av. n.e. (Joussaume & Laporte 2006). D’autres formes architecturales ont pu exister alors, qui ne sont pas accessibles au travers de la documentation disponibles. La répartition de ces tous premiers monuments mégalithiques dans le paysage a pu répondre à différents critères parmi lesquels figure bien évidemment l’emprise territoriale des différentes communautés vivant dans le secteur. Ce furent autant de points d’agrégations autour desquels semblent parfois s’être développé de vastes nécropoles, comme à la Boixe. Chaque nécropole est d’abord composée de la juxtaposition d’autant de monuments distincts. D’autres amorces n’ont sans doute pas connu un tel succès si bien qu’elles sont aujourd’hui difficiles à déceler. 40Les dolmens angoumoisins témoignent de techniques de construction déjà très largement maîtrisées, sans doute depuis de nombreuses générations, comme en attestent par exemple les dalles calcaires finement travaillées et assemblées qui forment la paroi de leurs chambres funéraires. On ignore en revanche si elles furent toutes construites ici dans un laps de temps très court, pendant la seconde moitié du Ve millénaire av. n. e., ou s’il s’agit d’une tradition régionale qui s’est transmise sur plusieurs centaines d’années encore. Toutes semblent d’abord incluses dans un monument circulaire. Leur taille varie considérablement même si cela résulte parfois aussi d’un élargissement, comme peut-être à la Boixe B. Au sein de la nécropole, une hiérarchie s’installe progressivement qui est perceptible au premier abord de par le volume des masses monumentales, le poids souvent considérable des dalles de couverture, ou le degré de finition des parois des espaces internes. 41En terme de visibilité, sous couvert boisé, il semble toutefois que cette hiérarchie n’ait guère été perceptible qu’au sein de la nécropole. Nous avons vu que la Motte de la Jacquille fait ici figure d’exception, car placée sur un point remarquable de la topographie régionale. Est-ce à dire que les structures mises en évidence par une précédente analyse, en terrain découvert, n’auraient aucune valeur ? L’opposition entre les nécropoles de Chenon et de Tusson, serait-elle totalement fortuite ? Ou au contraire, faut-il envisager un paysage beaucoup plus ouvert que ne le laisseraient supposer les résultats des analyses palynologiques, effectuées à partir d’échantillons uniquement prélevés en fond de vallée (et de surcroît plutôt en aval de notre secteur d'étude) ? Il est plus probable que cette analyse rende compte indirectement du territoire tel qu’il fut conçu et parcouru par les communautés néolithiques correspondantes, bien plus qu’elles n’ont jamais pu l’apercevoir d’un seul point de vue. À ce paysage mental, il faudrait d’ailleurs ajouter probablement quelques dépôts funéraires cachés au fond des grottes du réseau karstique, comme ceux du Néolithique moyen découverts récemment en Angoumois (Boulestin 2010), ou redécouverts dans le Cognaçais (Bailloud et al. 2008). 42La situation est toute différente pour ce qui concerne les grands tumulus allongés. Au sommet de telles constructions fondées sur le sol que foulent les vivants, le regard qui s’élève au dessus de la frondaison des arbres ne semble guère s’être attaché à repérer l’emplacement des installations du quotidien, probablement installées près du fleuve ou en fond de vallée. C’est le point que surplombe directement l’extrémité orientale du grand tumulus de la Folatière, implanté transversalement en rebord de plateau, dans une boucle de la Charente. D’ici, où qu’il se porte, l’œil humain perçoit directement l’organisation d’un territoire construit progressivement par les différentes communautés auxquelles ont appartenus les ancêtres ; paysage végétal ponctué par autant d’affleurements rocheux artificiels, blanchâtres, émergeant au loin d’un océan de verdure. On l’aura compris, il s’agit du sommet de ceux des monuments circulaires qui furent construits précédemment. Les longs tumulus révèlent ainsi, à un observateur posté sur son sommet, l’histoire d’un paysage dans toute la profondeur du temps qui émane de constructions funéraires. S’il est le fruit du passé, ce paysage est aussi, dans ce cas particulier, une projection dans le futur dès lors que l’espace sépulcral a, dès le départ, été aménagé de façon à accueillir ultérieurement quelques uns des morts des générations suivantes. 43La construction de ces longs tumulus rend compte également d’une façon un peu nouvelle, et sans doute un peu illusoire, de tenter de maîtriser l’espace. Nous avions déjà insisté sur les effets de perspectives qui déforment et contraignent la perception des volumes monumentaux, pour tout visiteur qui se déplace sur ses flancs (Laporte et al. 2001). Les dissymétries d’un plan dont on retrouve la structure inchangée aussi bien à Barnenez qu’à Prissé-la-Charrière, par exemple, induisent l’existence de points de vus privilégiés (Laporte 2013). À toute autre échelle, pour un observateur situé à l’extrémité occidentale du tumulus de la Folatière, à Luxé, lorsque le regard se porte d’un grand tumulus allongé vers un autre, on remarquera que les reliefs en sont presque comme effacés (fig. 5). Depuis ce point de vue, les distances semblent également comprimées de telle sorte que les nécropoles voisines de la Motte de la Garde et de Tusson, implantées sur deux crêtes distinctes, ne forment plus qu’une seule barre continue à l’horizon. 44Pourtant, en réalité, trois de ces cinq grands tumulus allongés sont implantés sur un même axe qui est perpendiculaire à celui des crêtes sur lesquelles ils reposent, ou des vallons qui les séparent (Joussaume et al. 1998). Les deux autres monuments encadrent le Gros Dognon de Tusson, sur une même crête. Cet axe principal est aussi celui qu’occupent les ensembles successifs de files de menhirs de la région de Carnac ; elles relient en amont nombre d’affleurements rocheux naturels, et forment comme une barre perpendiculaire à l’axe des vallons qui, en aval, convergent vers le golfe du Morbihan (Cassen 2009, pl. IV). Un peu comme si, parfois, ces deux manifestations très différentes du mégalithisme atlantique obéissaient aussi à quelques principes communs ; ce qui nous fait hésiter à les dissocier par trop dans le temps. Ce n’est d’ailleurs pas tout à fait le seul point de convergence entre dolmens et menhirs qui ont trop souvent été étudiées séparément, en particulier dans l’ouest de la France (Burl 1993, Boujot & Lorho 2005, Laporte 2011). Les travaux les plus récents menés sur l’île d’Hoëdic, dans le Morbihan, ont très bien montré comment ces dispositifs de pierres dressées à l’air libre avaient été l’objet de manipulations successives, et à quel point l’aspect sous lequel elles se présentent à nous aujourd’hui n’était guère que l’aboutissement d’un long processus (Large & Mens 2008) : un autre point commun, peut-être, avec ces longs tumulus qui nous occupent aujourd’hui. 45À travers l’intégration de modèles numériques de terrain et de végétation, ainsi que de la discussion sur la restitution architecturale des monuments, ce travail a proposé une approche novatrice pour les ensembles de monuments de la Charente. Des données procédant de différentes sources (archéologiques, palynologiques, géographiques) ont été soumises à plusieurs scénarios, autant d’hypothèses de travail, pour cerner les critères qui ont orienté l’installation et l’évolution des implantations humaines au Néolithique dans la région. 46Le recours aux analyses de visibilité a permit d’explorer le comportement des différents sites étudiés aussi bien par rapport à leur localisation que par rapport aux relations entre eux. Dans tous les scénarios analysés les grands tumulus allongés se présentent comme des éléments proéminents dans le paysage de la région. Les nécropoles de monuments circulaires semblent se singulariser lorsque des conditions de végétation restrictives sont appliquées ; les critères de hiérarchisation des monuments par masse, taille ou situation topographique semble se limiter dans ces cas au sein des nécropoles elles-mêmes. À l’échelle régionale il est intéressant de constater l’exclusion de l’ensemble de Chenon de la logique de visibilité propre aux ensembles de Tusson – Luxé – La Boixe. Elle est implantée sur un petit plateau qui domine le fleuve et qui occupe le centre d’une large cuvette ; la nécropole reste cachée à la vue de tout observateur qui serait situé sur les autres points hauts ; points hauts où se trouvent pourtant la plupart des monuments mégalithiques de la région. Le rapport avec la conception de l’espace d’habitat au Néolithique dans le secteur étudié reste peu accessible. Il semble cependant probable, dans l’état actuel des connaissances, qu’il existe une dissociation dans la localisation de ceux-ci par rapport aux espaces funéraires. 47Le paysage de la région étudiée peut enfin être défini comme un paysage monumental par agrégation, bâti au fil des siècles. Cette agrégation nous l’observons à trois niveaux complémentaires: avec l’implantation des monuments sur les différentes zones de la géographie, avec le groupement de monuments au sein d’une nécropole et avec l’intégration de différentes architectures au sein d’un même monument. Bailloud et al. 2008, BAILLOUD G., BURNEZ C., DUDAY H., LOUBOUTIN C. Eds., La grotte sépulcrale d'Artenac à Saint-Mary (Charente) : révision du gisement éponyme, Paris, Société préhistorique française, 2008, 126 p. (Travaux de la Société préhistorique française ; 8). Bernardin & Fabre 1995, BERNARDIN D., FABRE B., Rapport de prospection, Poitiers, Service régional de l'Archéologie Poitou-Charentes, 1995, n. p.
Bernardin & Fabre 2000, BERNARDIN D., FABRE B., Rapport de prospection, Poitiers, Service régional de l’Archéologie de Poitou-Charentes, 2000, n. p.
Billaud et al. 2001, BILLAUD Y., BURNEZ C., GAILLEDREAU J.-P., GOMEZ DE SOTO J., La Charente et son environnement anthropique du Néolithique à l'époque laténienne, in: Systèmes fluviaux, estuaires et implantations humaines de la préhistoire aux grandes invasions, L'helgouach J., Briard J. (Dir. ), Paris, Comité des Travaux historiques et scientifiques, 2001, p. 49-89 (Actes des Congrès nationaux des sociétés historiques et scientifiques ; 124 (Nantes, 1999)). Bouin 1994, BOUIN F., Inventaire des mégalithes du département de la Charente. Rapport final après prospections sur le terrain, Poitiers, Service régional de l’Archéologie de Poitou-Charentes, 1994, n. p.
Boujot & Cassen 1992, BOUJOT C., CASSEN S., Le développement des premières architectures funéraires monumentales en France occidentale, in: Paysans et bâtisseurs : l'émergence du Néolithique atlantique et les origines du mégalithisme : actes du 17ème Colloque interrégional sur le Néolithique, Vannes, 28-31 octobre 1990, Le Roux C.-T. (Dir. ), Rennes, Association pour la diffusion des recherches archéologiques dans l'ouest de la France, 1992, p. 195-211 (Revue archéologique de l'Ouest – Supplément ; 5). Boujot & Lorho 2005, BOUJOT C., LORHO T., Champs de menhirs de Carnac (Morbihan) comme champs d’expérimentation d’approches spatiales : le recours au SIG ?, in: Temps et espaces de l'homme en société : Analyses et modèles spatiaux en archéologie : actes des rencontres, 21-23 octobre 2004, Berger J.-F., Bertoncello F., Braemer F. et al. (Dir. ), Antibes, Association pour la Promotion et la Diffusion des Connaissances archéologiques, 2005, p. 259-262 (Rencontres internationales d'Archéologie et d'Histoire d'Antibes ; 25). Boulestin 2010, BOULESTIN B., Face aux mégalithes : sépultures en grotte du Néolithique moyen en Charentes, Archéo-Théma, Chaponnay, septembre, 2010, p. 24-. Burl 1993, BURL A., From Carnac to Callanish: the Prehistoric Stone Rows and Avenues of Britain, Ireland and Brittany, New Haven, Yale University Press, 1993, 320 p.
Burnez 1976, BURNEZ C., Le Néolithique et le Chalcolithique dans le centre-ouest de la France, Paris, Société préhistorique française, 1976, 376 p. (Mémoire ; 12). Cassen 2009, CASSEN S., Exercice de stèle : une archéologie des pierres dressées : réflexion autour des menhirs de Carnac, Paris, Errance, 2009, 158 p.
Chauvet & Lièvre 1877, CHAUVET G., LIÈVRE A.-F., Les tumulus de la Boixe, Bulletin de la Société archéologique et historique de la Charente Angoulême, 1877, p. 1-44, ill., 6 pl. Chouquer 2008, CHOUQUER G., Traité d’archéogéographie. La crise des récits géohistoriques, Paris, Errance, 2008, 200 p.
Criado Boado & Villoch Vásquez 2000, CRIADO BOADO F., VILLOCH VÁSQUEZ V., Monumentalizing landscape: from present perception to the past meaning of Galician megalithism (North-West Iberian Peninsula), European Journal of Archaeology, London, 3, 2, 2000, p. 188-216. Cummings et al. 2002, CUMMINGS V., JONES A., WATSON A., Phenomenology and asymmetry in the monuments of the black mountain, southern Wales, Cambridge Archaeological Journal, Cambridge, 12, 2002, p. 57-70. Daniel 1950, DANIEL G.E., The Prehistoric chambered tombs of England and Wales, Cambridge, Cambridge University Press, 1950, 256 p.
Diot et al. 1986, DIOT M.-F., GOMEZ J., MARINVAL P., Le site fortifié du Fort-des-Anglais à Mouthiers-sur-Boême (Charente) et son environnement protohistorique, in: Actes du 111ème Congrès national des Sociétés savantes, Poitiers 1986 ; Commission de pré- et protohistoire, Paris, CTHS, 1986, p. 331-346. Dron 2010, DRON J.-L., Condé-sur-Ifs (Calvados). De l’intérêt du radiocarbone, Archéo-Théma, Chaponnay, septembre, 2010, p. 16-. Gauron & Massaud 1983, GAURON E., MASSAUD J., La Nécropole de Chenon : étude d'un ensemble dolménique charentais, Paris, Editions du CNRS, 1983, 192 p. (Gallia Préhistoire. Supplément ; 18). Gauron & Massaud 1987, GAURON E., MASSAUD J., Le dolmen de la Motte de la Jacquille (Commune de Fontenille, Charente), un élément architectural inédit, Bulletin de la Société préhistorique française, Paris, 84, 2, 1987, p. 60-64. Giot 1959, GIOT P.-R., Le tumulus de Kermené en Guidel (Morbihan) : (Fouilles de 1957-1958), Annales de Bretagne, Rennes, 66, 1, 1959, p. 5-30, 10 fig. Giot et al. 1998, GIOT P.-R., MONNIER J.-L., L'HELGOUAC'H J., Préhistoire de la Bretagne, Rennes, Ouest-France, 1998, 580 p. (Université). Gomez De Soto 1997, GOMEZ DE SOTO J., La nécropole de la Boixe à Vervant, Maine-de-Boixe, Cellettes (Charente) : nouvelles recherches sur le monument C, in: Le Néolithique du Centre-Ouest de la France, Gutherz X., Joussaume R. (Dir. ), Chauvigny, Association des Publications chauvinoises, 1997, p. 183-191 (Actes du 21ème Colloque inter-régional sur le Néolithique, Poitiers, octobre 1994). Higuchi 1975, HIGUCHI T., The Visual and Spatial Structure of Landscape, Tokyo, Gihodo Publishing, 1975, 168 p.
Jenness 2006, JENNESS J., Topographic Position Index (tpi_jen.avx) extension for ArcView 3.x, v. 1.3a, http://www.jennessent.com/arcview/tpi.htm, Flagstaff, Jenness Enterprises, 2006. Joussaume 1985, JOUSSAUME R., Des dolmens pour les morts : les mégalithismes à travers le monde, Paris, Hachette, 1985, 398 p. (La mémoire du temps). Joussaume 1990, JOUSSAUME R. Ed., Mégalithisme et société : table ronde CNRS des Sables d'Olonne (Vendée), 2-4 novembre 1987, La Roche-sur-Yon, Groupe vendéen d'Etudes préhistoriques 1990, 235 p.
Joussaume 1997, JOUSSAUME R., Les longs tumulus du centre-ouest de la France, in: O Neolítico atlántico e as orixes do megalitismo: actas do coloquio internacional (Santiago de Compostela, 1-6 de Abril de 1996), Rodríguez Casal A.A. (Dir. ), Santiago de Compostela, Universidade de Santiago de Compostela, 1997, p. 279-298 (Cursos e congresos da Universidade de Santiago de Compostela; 101). Joussaume et al. 1998, JOUSSAUME R., LAPORTE L., SCARRE C., Longs tumulus néolithiques et organisation de l'espace dans l'ouest de la France, in: Organisation néolithique de l'espace en Europe du Nord-ouest. Actes du 23ème Colloque interrégional sur le Néolithique (Bruxelles, 24-26 octobre 1997), Cauwe N., Van Berg P.-L. (Dir. ), Bruxelles, Société royale belge d'Anthropologie et de Préhistoire, 1998, p. 259-276 (Anthropologie et Préhistoire ; 109). Joussaume 2003a, JOUSSAUME R., Les charpentiers de la pierre : monuments mégalithiques dans le monde, Paris, La Maison des Roches, 2003, 128 p. (Terres mégalithiques). Joussaume 2003b, JOUSSAUME R., Du réaménagement des monuments funéraires néolithiques dans le Centre-Ouest de la France, in: Sens dessus dessous : la recherche du sens en préhistoire : recueil d'études offert à Jean Leclerc & Claude Masset, Averbouh A., Bodu P., Chambon P. et al. (Dir. ), Amiens, Service régional de l'archéologie en Picardie, 2003, p. 157-172 (Revue archéologique de Picardie - numéro spécial ; 21). Joussaume et al. 2006, JOUSSAUME R., CADOT R., GILBERT J.-M., Les Tumulus de Champ-Châlon à Benon (Charente-Maritime), La Roche-sur-Yon, GVEP, 2006, 90 p. (Groupe vendéen d'études préhistoriques ; 42 ). Joussaume & Laporte 2006, JOUSSAUME R., LAPORTE L., Monuments funéraires néolithiques dans l’ouest de la France, in: Origine et développement du mégalithisme de l’ouest de l’Europe : colloque international, 26-30 octobre 2002, Bougon (France), Joussaume R., Laporte L., Scarre C. (Dir. ), Bougon / Niort, Musée des Tumulus / Conseil Général des Deux-Sèvres, 2006, p. 319-344. Joussaume et al. 2008, JOUSSAUME R., GIRAUD C., CRÉDOT R., BERNARD R., CROS J.-P., FOUÉRÉ P., MENS E., Le dolmen des Goudours à Folles (Haute-Vienne) et les dolmens à chambre axiale allongée dans le Centre-Ouest de la France, Préhistoire du Sud-Ouest, Cressensac, 16, 1, 2008, p. 3-54. Joy 1990, JOY P.-F., Rapport de prospections aériennes et pédestres sur les cantons de Aigre, Mansle et Villefagnan (Charente), Poitiers, Service régional de l’Archéologie de Poitou-Charentes, 1990, n. p.
Joy 1998, JOY P.-F., Rapport de prospections aériennes et pédestres sur les cantons de Aigre, Mansle et Villefagnan (Charente), Poitiers, Service régional de l’Archéologie de Poitou-Charentes, 1998, n. p.
Joy 2002, JOY P.-F., Rapport de prospections aériennes et pédestres sur les cantons de Aigre, Mansle et Villefagnan (Charente), Poitiers, Service régional de l’Archéologie de Poitou-Charentes, 2002, n. p.
Kerdivel 2009, KERDIVEL G., Occupation de l’espace et gestion des ressources à l’interface entre massifs primaires et bassins secondaires et tertiaires : l’exemple du Massif armoricain et de ses marges au Néolithique, Université Rennes I, 2009, Thèse de Doctorat, 500 p.
Laporte et al. 2001, LAPORTE L., JOUSSAUME R., SCARRE C., Megalithic Monuments of west-central France in their Relationship to the Landscape, in: Monumentality and Landscape in Atlantic Europe, Scarre C. (Dir. ), London, Routledge, 2001, p. 73-83. Laporte et al. 2002, LAPORTE L., JOUSSAUME R., SCARRE C., Le tumulus C de Péré à Prissé-la-Charrière (Deux-Sèvres) : état des recherches après 6 années d'intervention, Gallia Préhistoire, Paris, 44, 2002, p. 167-214. Laporte & Le Roux 2004, LAPORTE L., LE ROUX C.-T., Bâtisseurs du Néolithique : mégalithismes de la France de l'Ouest, Paris, La Maison des Roches, 2004, 126 p. (Terres mégalithiques), http://halshs.archives-ouvertes.fr/halshs-00279992/fr/. Laporte et al. 2010, LAPORTE L., SCARRE C., JOUSSAUME R., SOLER L., Nouvelles données sur le mégalithisme de l’ouest de la France. Recherches en cours autour du tumulus C de Péré à Prissé-la-Charrière (Deux-Sèvres), Archéo-Théma, Chaponnay, septembre, 2010, p. 7-12. Laporte 2010a, LAPORTE L., Restauration, reconstruction, appropriation : évolution des architectures mégalithiques dans l’ouest de la France, entre passé et présent, in: Actas del Congreso Internacional sobre Megalitismo y otras manifestaciones funerarias contemporáneas en su contexto social, económico y cultural, Fernández Eraso J., Mujika Alustiza J.A. (Dir. ), Donostia, Aranzadi Zientzia Elkartea, 2010a, p. 15-46 (Munibe. Suplemento; 32). Laporte 2010b, LAPORTE L., Innate and/or Expressed Identities: their Conceptualization trough Monumentality, Funerary Practices and Grave Goods: Some Examples from the Megalithic Tradition of Western France, in: Megaliths and Identities: Papers delivered at the third European Megalithic Studies Group Meeting 13th - 15th of May 2010 at Kiel University, Germany, Furholt M., Lüth F., Müller J. et al. (Dir. ), Kiel, Institut für Ur- und Frühgeschichte, 2010b, p. 1-47, 47 p. (Journal of Neolithic Archaeology), http://www.jungsteinsite.de/. Laporte et al. 2011, LAPORTE L., JALLOT L., SOHN M., Mégalithismes en France : nouveaux acquis et nouvelles perspectives de recherche, Gallia Préhistoire, Paris, 53, 2011, p. 289-334. Laporte 2013, LAPORTE L., Les carrières fournissant le petit appareil employé dans la construction des masses tumulaires. Mégalithismes de l’ouest de la France, projets architecturaux, stratégies d’approvisionnement et techniques mises en oeuvre pour l’extraction, in: Les premières architectures en pierre en Europe occidentale : du Ve au IIe millénaire avant J.-C., Guyodo J.-N., Mens E. (Dir. ), Rennes, Presses universitaires de Rennes, 2013, p. 79-106 (Archéologie & Culture). Large & Mens 2008, LARGE J.-M., MENS E., L'alignement du Douet à Hoëdic (Morbihan, France), L'Anthropologie (Paris), Paris / Amsterdam, 112, 4-5, 2008, p. 544-571. Le Goffic 2006, LE GOFFIC M., La nécropole mégalithique du Souc’h en Plouhinec, in: Journée de civilisations atlantiques et archéosciences, Rennes, 9 mars 2002, Rennes, UMR 6566 du CNRS "Civilisations atlantiques et archéosciences", 2006, p. 24-25. Lecornec 1994, LECORNEC J., Le Petit Mont, Arzon, MorbihanAssociation pour la diffusion des recherches archéologiques dans l'ouest de la France, 1994, 109 p. (Documents archéologiques de l'Ouest). Lhomme 1993, LHOMME V., Inventaire des mégalithes du département de la Charente, Poitiers, Service régional de l’Archéologie de Poitou-Charentes, 1993, n. p.
Llobera 2003, LLOBERA M., Extending GIS-based analysis: the concept of visualscape, International Journal of Geographical Information Science, London, 17, 1, 2003, p. 25–49. Llobera 2007, LLOBERA M., Modelling visibility through vegetation, International Journal of Geographical Information Science, London, 21, 2007, p. 799–810. López Romero 2008a, LÓPEZ ROMERO E., Modelos predictivos para el estudio del Neolítico: aplicación del Análisis de Regresión Simple y Análisis Discriminante al megalitismo de la cuenca del Sever (España-Portugal), in: IV Congreso del Neolítico Peninsular: [Alicante] 27-30 de noviembre de 2006. Vol. 1, Hernandez Pérez M.S., Soler Díaz J.A., López Padilla J.A. (Dir. ), Alicante, MARQ, 2008, p. 275-280. López Romero 2008b, LÓPEZ ROMERO E., Characterizing the evolution of visual landscapes in the Late Prehistory of Southwest Morbihan (Brittany, France), Oxford Journal of Archaeology, Oxford, 27, 3, 2008, p. 217-239. López Romero 2008c, LÓPEZ ROMERO E., Monuments néolithiques de la région de Lorient (Morbihan, Bretagne) : à propos des modes d’organisation des territoires, L'Anthropologie (Paris), Paris, 112, 2008, p. 572-597. López Romero et al. 2010, LÓPEZ ROMERO E., BERNARD R., LAPORTE L., GOMEZ DE SOTO J., JOUSSAUME R., Des géants un peu oubliés. Nécropoles tumulaires des Charentes et territoires habités, Archéo-Théma, Chaponnay, septembre, 2010, p. 19-23. Löwenborg 2009, LÖWENBORG D., Landscapes of death: GIS modelling of a dated sequence of prehistoric cemeteries in Västmanland, Sweden, Antiquity, Oxford, 83, 322, 2009, p. 1134-1143. Marambat 1992, MARAMBAT L., Paléo-environnement et empreinte anthropique dans l'Ouest Aquitain et la Saintonge à l'Holocène, Université Bordeaux 1, 1992, Thèse de Doctorat, 2 vol., 208 p.
Michon 1844, MICHON J.-H., Statistique monumentale de la Charente, Paris, Derache, 1844, 334 p.
Patte 1941, PATTE E., Sur les affinités culturelles de la Charente au Chalcolithique, Revue anthropologique, Paris, 51, 7-9, 1941, p. 67-121. Patte 1966, PATTE E., Le dolmen de la Folatierre à Luxé (Charente), Gallia Préhistoire, Paris, 9, 2, 1966, p. 419-435. Persson & Sjögren 2001, PERSSON P., SJÖGREN K.-G., Falbygdens ganggrifter, Göteborg, Göteborgs Universitet, 2001, 369 p. (GOTARC (Serie C). Arkeologiska skrifter; 34). Rossignol 2002, ROSSIGNOL J.-Y., Tumulus de Bougon et paysage, in: Les tumulus de Bougon (Deux-Sèvres) : complexe mégalithique du Ve au IIIe millénaire, Mohen J.-P., Scarre C. (Dir. ), Paris, Errance, 2002, p. 186-. Roughley 2002, ROUGHLEY C., Les monuments de Bougon, partie intégrante du paysage, in: Les tumulus de Bougon (Deux-Sèvres) : complexe mégalithique du Ve au IIIe millénaire, Mohen J.-P., Scarre C. (Dir. ), Paris, Errance, 2002, p. 181-. Scarre et al. 2003, SCARRE C., LAPORTE L., JOUSSAUME R., Long Mounds and Megalithic Origins in Western France: Recent Excavations at Prissé-la-Charrière, Proceedings of the prehistoric Society, Cambridge, 69, 2003, p. 235-251. Testart 2005, TESTART A., Eléments de classification des sociétés, Paris, Errance, 2005, 156 p. (Collection des Hespérides). Tilley 1994, TILLEY C.Y., A phenomenology of landscape places, paths and monuments, Oxford, Berg, 1994, x + 221 p. (Explorations in anthropology). Wheatley 1995, WHEATLEY D.W., Cumulative viewshed analysis: a GIS-based method for investigating intervisibility, and its archaeological application, in: Archaeology and geographical information systems: a European perspective, Lock G.R., Stancic Z. (Dir. ), London, Taylor & Francis, 1995, p. 171-187. 1 La résolution spatiale du modèle numérique de terrain étant fixée à 50 m par pixel (ce qui s’accorde bien avec une étude de type micro-régionale comme la notre ainsi qu’avec l’échelle des données cartographiques d’origine) les clairières de 100 m autour des monuments posaient des problèmes d’échelle pour l’analyse, car trop réduites. Elles doivent donc être considérées avec précaution.